From 4 October to 10 November 2013, London’s Somerset House, which stretches from the Strand to the Embankment, was home to Forgotten Spaces 2013, an exhibition showcasing the 26 shortlisted (of 147) entries in the Royal Institute of British Architects’ competition of the same name. Located in the Lightwells (the two meter wide subterranean passageway that runs between three of the House’s inner walls and the sides of the fountain court) and in the Deadhouse (the tunnels beneath the fountain court where gravestones were relocated during the Georgian rebuilding of the House), it is fairly minimalist: a pair of information boards per entry, including artists’ impressions and, perhaps, photographs of the location as it currently appears or as it used to be fifty or a hundred or more years ago; occasional architects’ models or dioramas; several small installations. It is as if William Gibson’s cool hunters raided the Bridge for ideas to commodify but ended up doing school projects instead. Forgotten Spaces is a rather spectral affair. Ghosts of London’s multiple pasts appear in glimpses; histories that played out differently than expected flicker and flit among the Deadhouse stands; and each display conjures a possible future that, like the dirigible cheekily lofting in the blue evening sky above A Lost World, is never seriously intended to become reality. (Meanwhile, dancing just out of reach are reputation and the possibility of actual commissions.) The exhibition inserts possibility into deeply sedimented urban spacetime. Each entry refuses to accept that a city’s retrofitting must succumb to the dystopianism of Syd Mead’s Blade Runner Los Angeles. But utopian desire is everywhere haunted by the phantasm of corporate co-optation. Neoliberal capital frames every project. 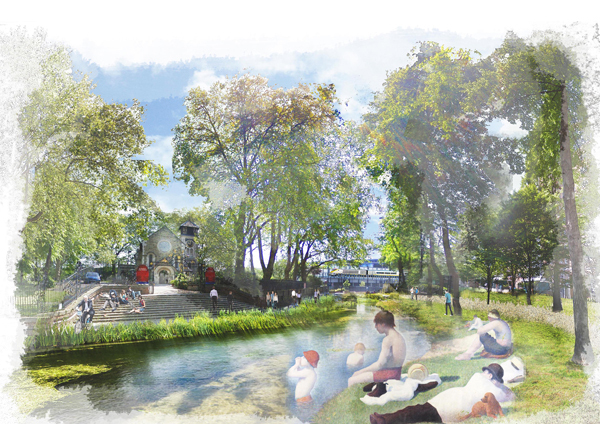 Few of them would have any chance without corporate sponsorship, and those that might get by without it—such as Urban Agri-Aqua Culture’s plan to convert an abandoned Kingston Upon Thames sewage works into a fish, fruit and vegetable farm—cannot hope to escape the inertia of property and the menace of land values. The scale of the projects varies considerably. Bikebox wants to create a network of emergency cycle repair stations from the iconic K6 red telephone boxes falling into relative disuse across the city, while In the Canopy raises ladders up to treetop perches, opening up new vistas for adults reliving childhood tree-climbing antics. The Lepidopterium is an exotic butterfly house, situated on a patch of ground next to a railway line, itself already a haven to native species. 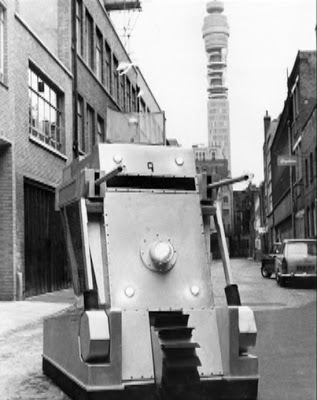 Recalling some of London’s earliest streetlights, fuelled by methane from the sewers, Hidden Light imagines pipes that slowly telescope up into the air as they fill with sewer gas and, on reaching their full extension, burn it off in a spectacular flare before telescoping down to ground level once more. Another piece of outmoded gas technology, the gasometer, fascinates entrants. The Gasworks retains the cylindrical lattice that used to frame the gasholder when it was above ground, and decorates it with panels off which light can be bounced, creating the effect of a giant lantern, while the cavernous space below, which held the retracted gasholder, becomes a gallery, with a long ramp sweeping down around the outer wall. 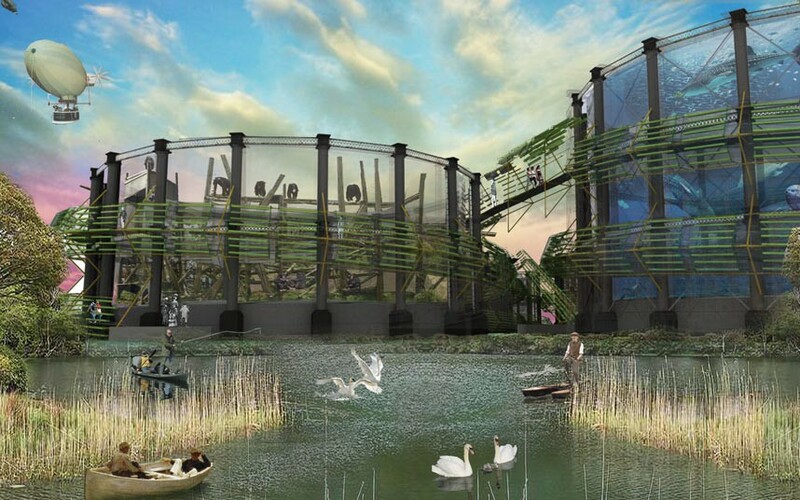 A Lost World envisions several adjacent gasometers housing a zoo and aquarium, with their anaerobically digested waste sustaining a lake and wetlands. Reclaiming the Canalside has its eye on gasometers as the centerpiece of an urban park, while Sculpture & Sons seems happy merely to have a gasometer visible in the background of its five-storey reconfigurable sculpture park. Plunging beneath the ground, Museum of Memories is an archive of artifacts situated in the terminus of the old London Necropolis Railway (which, I swear, is, or was, a real thing). With more than a hint of Passport to Pimlico (Cornelius UK 1949) about it, Aldwych Baths is a decommissioned tube station turned swimming baths; Aquadocks is a similar, if rather more up-market, scheme for the airy, columned space beneath the Royal Docks. In contrast, Fleeting Memories wants to bring water above ground, returning the River Fleet to the surface near St. Pancras where, according to the crafty artists’ impression, Seurat’s Bathers at Asnières (1884) will idle away London days; and The Centre for Forgotten Beer wants to recover London’s brewing history and bring long abandoned beers—their flavors and smells—back into circulation. While some projects prioritize recycled and reusable materials, others seem mostly to harvest buzzwords (“responsive,” “innovative,” “permeable public realm”). Some are difficult to distinguish from the ongoing gentrification of Docklands and other rising boroughs. Many of those that want to recover river and canal banks seem little different—give or take a tree or two, some wetlands, or a strip of garden—to the soulless piazza behind the new Paddington Station development. A number of entries seem to belie their nature as hypermodern spaces by imagining themselves as, in Marc Augé’s terms, places. Guerrilla gardening and other urban insubordinations are pre-empted by the occasional bed devoted to urban agriculture, and innovation from below becomes draped in the discourse of increasing “food security” against a backdrop of rising global populations (as if produce from an urban fish farm might actually end up on regular folks’ dinner tables rather than the menu of a boutique restaurant). Other, related dystopianisms lurk in equally plain view. Many entries talk about providing spaces for “the community,” but no one seems even to have consulted with actually existing communities in which these forgotten spaces exist. Has the ideological commitment to neoliberal regeneration reached the point where “the community” is always-already in the subjunctive tense? Are incoming hipsters always-already gathering, like Hitchcock’s birds? About halfway around the displays, I realized that in all the artists’ impressions there had not been a single person of color, and the only one I subsequently spotted in any of the exhibition’s images was in a “before,” rather than an “after,” picture. Is this the real future of London to be found in Forgotten Spaces 2013? Artists’ impressions of the 26 shortlisted entries can be seen at the RIBA London website. A version of this review appeared in Science Fiction Studies 123 (2014): 467–9.